The healthcare space is having to keep pace with the needs of patients. In days past, consumers relied on word-of-mouth referrals from families and friends to inform healthcare decisions. And they had a finite number of interactions with a brand before making those choices. Now, we’re fully immersed in what Google has dubbed the Zero Moment of Truth (ZMOT)—or, the evolution in the way that consumers search for information. These days, patients are empowered to make their own purchasing decisions. The internet has provided opportunities for patients to read reviews, research doctors, and compare prices. According to Google, 88 percent of all consumers research online before they commit to a practice. As a byproduct, search engines have an influence over decision making. Because patients increasingly rely on search engines for healthcare information, marketing material and messaging must correspond around the patient’s journey. And healthcare providers must adapt. Knowing how to create engaging content that resonates with your audience is crucial. This means knowing which types of content to create. But it also means knowing how and when to share this content—and which advertising channels to leverage. Often credited as the pioneers of inbound marketing, HubSpot basically wrote the book on the inbound methodology. As these techniques become more recognized in the industry, we’ve adapted the traditional sales funnel—alternatively known as the purchase or purchasing funnel—to correspond to content creation. Much like in the inverted pyramid model of the sales funnel—in which prospects move from the top of the funnel, to the middle of the funnel, to the bottom of the funnel—healthcare marketers can reach their patients at different stages in their purchasing journey: from awareness, to consideration, all the way down to interest. 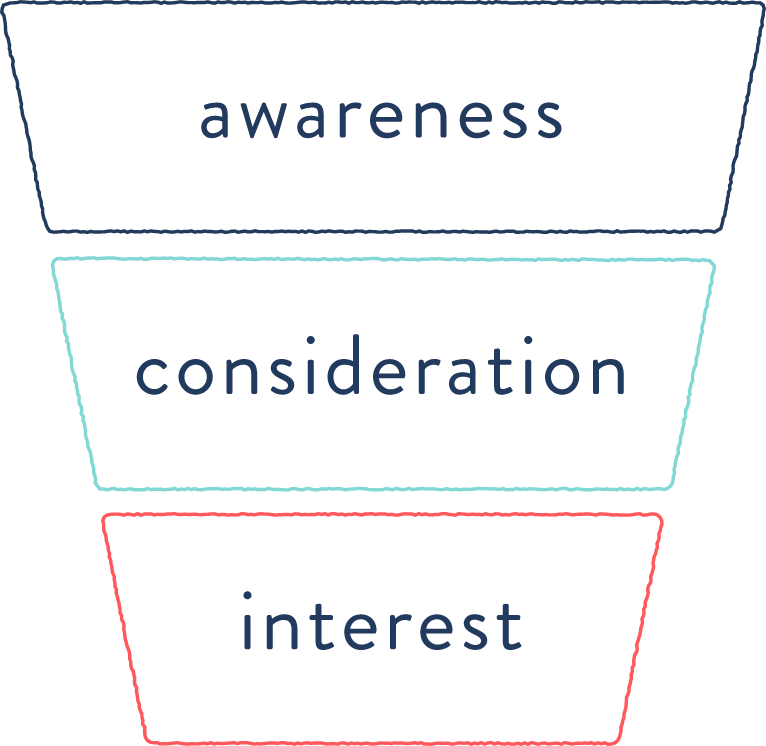 Traditionally, top of the funnel marketing refers to lead generation and targeting campaigns that generate early awareness in the buying process. And obviously, it’s important for organizations to introduce their brand to prospective patients. Content at this stage should establish authority and trustworthiness. It should educate and inform. Top of the funnel prospects will be looking for help. They have a specific problem and are looking for a solution. To know your prospective patients is know their challenges. From locating an urgent care facility for a broken bone, to finding a new primary care physician, it’s important that you address healthcare problems with relevant content like blogs, videos, and eBooks. It’s also important to know what terms they’re searching for to answer their questions. Once you uncover your prospect’s challenges, it’s far easier to tailor your content to fit their needs. Targeted search ads can empower your personas to find a solution to their problem. And paid digital marketing can help you reach new patients through precise demographic targeting. While top-of-funnel content is an obvious first-choice for content creation, reaching personas in the middle of the funnel helps move them further down the road. At this stage, patients are aware of who you—or your practice—are. Now is the time for you to #humblebrag. Show them why they should choose your practice over your competitors. For example, patient reviews, testimonials, and case studies are middle-of-the-funnel content pieces that display the expertise and knowledge of you and your staff members. Similarly, video interviews with staff members can help humanize your brand. And finally, video tours of your hospital can provide a first-hand glimpse into your facilities and establish rapport. While you’re still a step away from converting at the bottom of the funnel, now is the time to make meaningful connections with prospective patients. They’ve already shown interest; now is the time for you to shine. The last stage of the funnel is arguably the most important for the bottom line of your hospital—as it turns prospects into real patients. Your goal here is to make it simple for your audience to convert. Of course, conversions are something different for everyone; but generally, in the healthcare space, they mean getting a new customer in your doors. Bottom-of-the-funnel leads should be able to answer any lingering questions they may have through targeted webinars and Q&As. They should be able to click through to landing pages that are tailored with specific messaging. And they should know how to call your hospital, click to book an appointment, or fill out a submission form. Optimized Google My Business listings increase your visibility on Google maps and search engine results pages. While these listings undoubtedly affect the patient experience at every stage, features like Google My Business Posts and Q&As are useful bottom-of-the-funnel techniques, as they build rapport with prospects. And ultimately, an accurate listing ensures your contact information is up-to-date—should they choose your practice. Where are you in your efforts? Healthcare digital marketing can reach new patients across all stages of the buying cycle. By creating relevant marketing messaging and investing in SEO and PPC strategies to make the most of your efforts, your practice can boost its patient acquisition process—and get more people in the door.